There are some cultures where traditions and rituals have been practiced for generations with no sign of slowing down. Jewish faith practices have stood the test of time, especially when it comes to wedding ceremonies. Both beautiful and intriguing, Jewish wedding customs hold deep meaning and symbolism in the Jewish community. When planning a wedding ceremony today, it’s easy to forget cultural traditions while caught up in a whirlwind of tulle gowns, gold leaf invitations and catering menus. But these traditions can often provide just the sentimental value or emotional push your wedding needs. 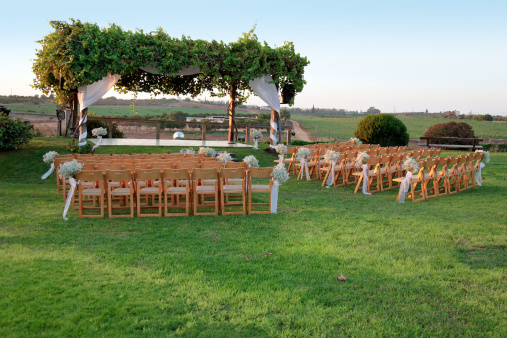 In Jewish wedding ceremonies, there are two customs that are both charming and intriguing. The chuppah or huppah, which translates to “canopy” or “covering,” is the canopy area where the couple stands during the ceremony. This tradition dates back to the nomadic days of the Jewish people traveling in the desert. The canopy is used to symbolize the couple creating their new household together and proclaiming their love and commitment in front of the community. The huppah usually consists of four sides or posts with a square cloth made of silk or velvet. Without any other specific requirements, the huppah allows for an artistic approach or the couple’s personality to be incorporated with flowers or other adornments throughout. The second custom, and perhaps one of the most well known parts of a Jewish wedding ceremony, is the breaking of the glass. The breaking of the glass happens at the end of the Jewish wedding ceremony following the seven blessings. There are many explanations or reasoning behind the breaking of the glass, but in the ceremony, the act signals the crowd into shouts of “Mazel Tov” and ultimately means the ceremony is over and it’s time for celebration. Many believe it symbolizes the destruction of the Temple in Jerusalem, as well as the fragility of human relationships or marriage itself and that the couple should enjoy each day as if it were their last. No matter what one believes it symbolizes, it is an exciting way to end the beautiful ceremony and begin the celebration of the couple’s lives together. Both of these traditions add their own flare, meaning and sentimental value to any Jewish wedding ceremony. They can also act as inspiration for different aspects of non-Jewish ceremonies.